** Important ! ** If you invest Rs. 15,000 once a year in an investment that averages a 20% annual return the amount you will get after 40 years when you will be in your 60's which will be the time you'll be ready to retire will be Rs. 2,20,46,573 that is 2.2 Crore Rupees, yes you heard it right, investing Rs. 50 /- for everyday for just one year (300 days) you can be a Double Crorepati after 40 years. This is an unbelievable amount for sacrificing a part of tea/lunch money everyday. This is the power of compounding for you. I am happy to share more details just WHATSAPP me on +919239176426 ! We have just released 2 New Hidden Gems last week ! 1) Hidden Gem 1 : The company is into the fast growing global animal API business and caters to the dairy, poultry and aqua industries.The company is available at 6.5x FY18 EBIT multiple.The company is expected to have an adjusted EPS of 14rs in fy18 and 19rs in fy19. If we give a 20pe multiple...we get a price target price of 380/share which is significantly above today's price of 130/share.The company is expected to grow at a very rapid pace in the next 2-3 years. 2) Hidden Gem 2 : Its one of the cheapest housing finance companies available in the market today. The company is available at a cheap 3x APBV..management has guided for very strong 50% growth annually for the next 5 years..this company can easily end up becoming a MultiBagger in coming month thanks to its wonderful management ! Questions. So Why you need our Expert Advise to Choose Companies which can make you Double Crorepati or even more ? Verify the returns here [ https://youtu.be/uYfMIAQ0T1E ] and realize the Power of Equity Investment ! 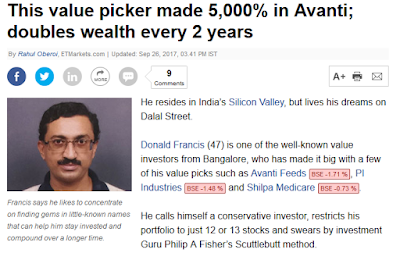 Remember the BIG names we hear - Rakesh Jhunjhunwala, Ramesh Damani, Vijay Kedia and Porinju Veliyath these are all investors which have grown their wealth 100X with investing in stocks. 4. Exit Call if there is any. 1. Do not invest your money in a single stock. Have a portfolio of 10-15 stocks. 2. Don't watch the markets every day. 3. Do not worry about short term volatilities in the market. In the long run, such jerks in the markets do not matter. 4. Keep a close eye on the earnings of the company and the developments related to that company. 5. Do not book profits too early and let the business mature to get you 5 times 10 times type of returns. 6. Exit from the stock at the right time – If the fundamentals are not supporting or valuations are too high. DO you still think our Charges our HIGH ?? IMP : Our Youtube Channel now has over 11,800+ subscribers - Make sure you subscribe now [ Click here ] !